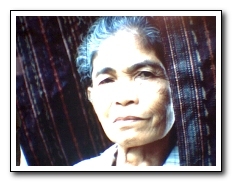 Salinta Monon is probably the last Bagobo weaver of the Philippines. You'll find some of her woven creations at the Museum of the Filipino people, which we visited last Saturday. I thought the kids we brought along would be bored, but they were pretty much excited right from the start. The first gallery room we entered showed some finds from the Spanish galleon San Diego, a wreck found 52 meters beneath the waves off the port of Batangas in 1991.